The York Revolution have announced the Atlantic League contract of infielder Mikey Reynolds has been purchased by the St. Louis Cardinals. It marks the first time in the nine-year history of the Revolution that St. Louis has purchased the contract of a York player in-season, and Reynolds is the second former Rev to join the Cardinals organization. 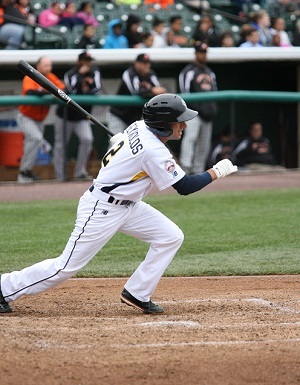 The third-year pro Reynolds played both second base and shortstop for York. He was selected by the Atlanta Braves in the fifth round of the 2013 draft out of Texas A&M. In his professional debut at Danville in the Rookie Appalachian League that season, he batted .309 in 44 games. For the Revolution, Reynolds finished second on the club in hitting in 2015, appearing in 73 games around the injury. He got on base at a .356 clip for the Revs. Had it not been for the injury, Reynolds’ rights would have most likely been purchased during the regular season by an MLB organization. Playing well above his experience level in the Atlantic League, York was braced for his departure, especially after his torrid start hitting the ball against Triple-A and MLB veterans. Reynolds had not played above Single-A with Atlanta. Class A Peoria (Midwest League) and/or A-Advanced Palm Beach (Florida State League) seem to be likely destinations for Reynolds in 2016, at least to begin. Reynolds will attempt to be the ninth former Rev to reach the Major Leagues after playing in York. He joins fellow teammates Jose Constanza (OF, Rays) and Shannon Wilkerson (OF, Twins) as players to join MLB organizations from the Revolution roster this season. Since the beginning of the 2014 season, the Revolution has seen five former players appear on Major League rosters, a number unmatched over that period by any Atlantic League franchise. LHP Scott Rice (Mets), LHP Ian Thomas (Braves/Dodgers), RHP Julio DePaula (Orioles), LHP Ryan Feierabend (Rangers) and 3B Andy Marte (Diamondbacks) have all donned Major League uniforms since April 2013 after playing in York between the 2011 and 2014 seasons.